With my brother visiting last week, I had a lot of amazing meals. He even made us dinner one night (delicious steak tacos). 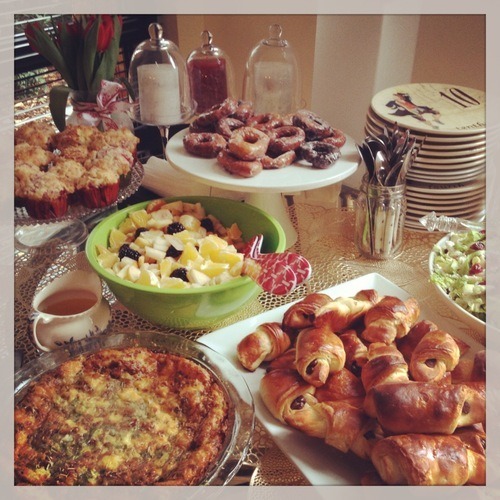 But my favorite meal of the week was the holiday brunch we hosted for 25 of our friends on Sunday. I made a couple of items previously posted on here (pumpkin donuts, croissants, and cranberry pear salad) and a new one (raspberry muffins). Plus, Dave made a strata with bacon, green onions, and cheese. So while the brunch ended up turning out well, there were a few moments when I wondered why I had volunteered to squeeze 25 people in our small one bedroom apartment on a Sunday morning. Brunches are hard because everything seems to need to be done at the last minute (which resulted in me being in pajamas when the first guests showed up). But I have to say, I’ve decided it’s my favorite event to host. I love being able to just hang out on a Sunday, without feeling rushed, or tired. Plus cleaning up is much easier to do when its 5pm on a Sunday and not 1am on a Saturday night. Anyways, I promise to get the strata recipe up soon (it’s been a big hit every time we’ve made it). I’m headed to California for the holidays at the end of the week, and won’t be back to DC (and my computer) until after New Year’s, so there may not be any posts for the next two weeks (we’ll see how relaxed I get on vacation). But happy holidays everyone! Looking forward to more posts in 2013.